The shop was founded by Arthur Knippenburg, but he gave the outlet to an old friend, Clyde Holbrook, after only a few weeks. 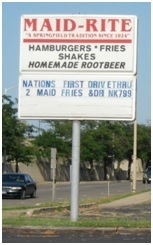 The restaurant became part of Maid-Rite, an Iowa-based chain offering “loose meat ground beef” sandwiches in 1930. Keith Sculle, co-author of Fast Food: Roadside Restaurants in the Automobile Age, has written that Springfield’s Maid-Rite is “a rare architectural survivor and a significant landmark.” It is listed on the National Register of Historic Places. More information: National Register application, on file in the Sangamon Valley Collection at Lincoln Library. This entry was posted in Business, Historic Sites and tagged National Register-Sangamon County, Restaurants. Bookmark the permalink. The Springfield location is and always has been independent of the Iowa location’s. It was built in 1921 and the Iowa location’s came about in 1926. To this day the Springfield Illinois location is not part of the Iowa franchise. Springfield is the Only Maid-Rite Sandwich Shop with A Drive up Window. The Building Built in 1929. And Was Listed on The National Register Of Historic Places In 1984. What A Place to go and Feel Like Family. I Have Been Going Here Since I was a Small Girl With My Grandmother Who Was Here In The Earlier Days. And I Have Been Here Many Times With My Mother and My Daughter and My Three Grandchildren As Well. The Food is Awesome and The Only Maid-Rite With Frosty Mugs For Your Rootbeer. Sam and His Wife Are The Best. They Always Take Good Care Of Us. It’s Such a Cute Place. And Very Clean. So Go Try it For Lunch you will not Be Disappointed.